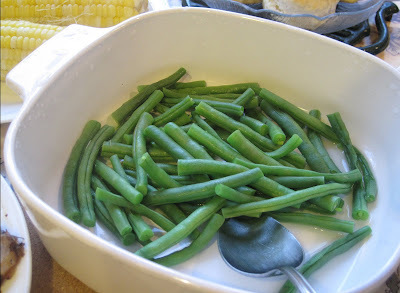 Sunday we cooked dinner for my mom. 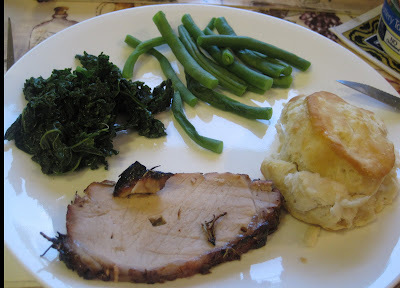 We decided on a pork roast, mostly because our freezer is pretty crowded and we figured we should eat something from it to make a little space. But how to cook the pork? We decided to cook it on the grill on the rotisserie. But how to season it? Last time we just used olive oil and salt. It was OK but not very inspired. 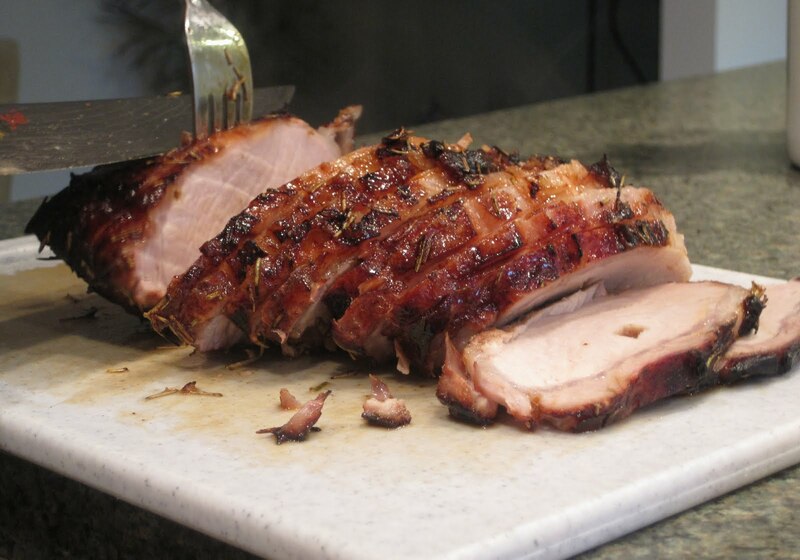 We like Paula Deen's marinade for Pork Tenderloin with Root Vegetables (see recipe page for recipe), but it works best on tenderloin and this was a roast. We started flipping through cookbooks and browsing food websites, looking for inspiration - and for some reason, it was difficult to get inspired! 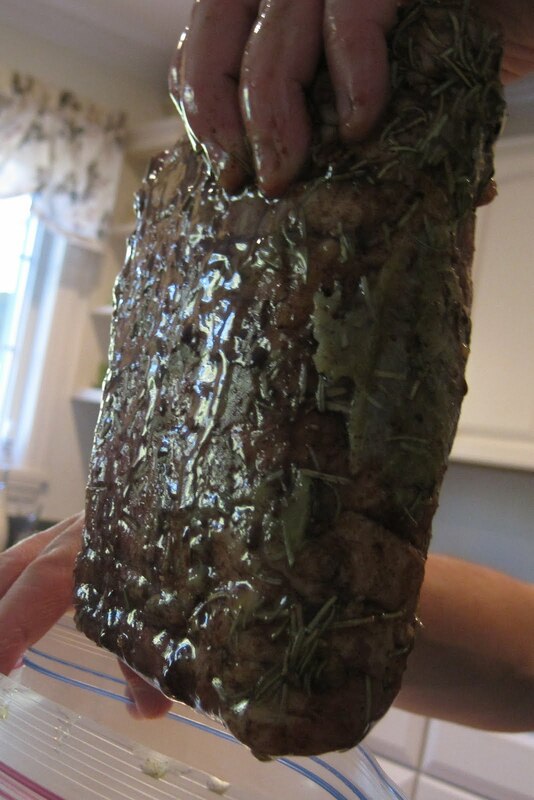 We finally settled on a very simple marinade: canola oil, balsamic vinegar, and rosemary. We scored the top of the pork, marinated the pork for a few hours, and then skewered it on the rotisserie: Mmmmm yummy rosemary bits! We opted to not save the marinade, boil it, and use it as a 'gravy.' While piggy rotated on the grill, we made a few other dishes. 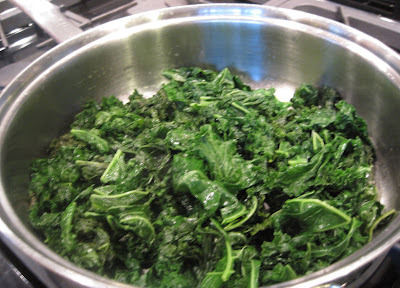 One dish was kale. One day we were at a flooring store and as we were leaving, our path was blocked by a young woman unloading greens from the back of her SUV. No big deal - we just sat there, enjoying the sunshine and talking about flooring. But then the young woman approached our car and asked if we liked kale. Well, yes. Then she asked if we wanted some. 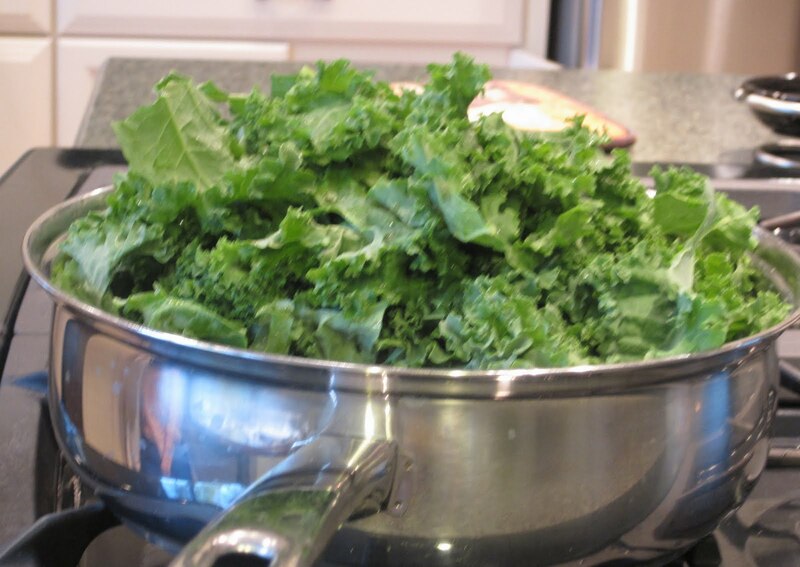 Um, OK. We offered to pay her, but she said she runs a farm and they have some kind of grant to grow food and give it to food kitchens and for some reason that day they couldn't make a delivery so she had all this kale she was trying to give away. She gave us a grocery bag stuffed with kale. We gave half of it to Googer and cooked the other half. We simply wilted it in a large saucepan with a little olive oil in the bottom and added a tablespoon or two of chicken broth for flavor. 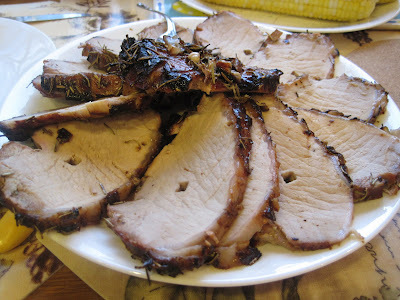 Before: After: Cooked pork, resting on the cutting board: Sliced pork: No pink, just the way I like it. However, we did overcook it a bit. I know I always say that a meat thermometer is so great and we always use one and so you're probably wondering how we managed to overcook the pork. 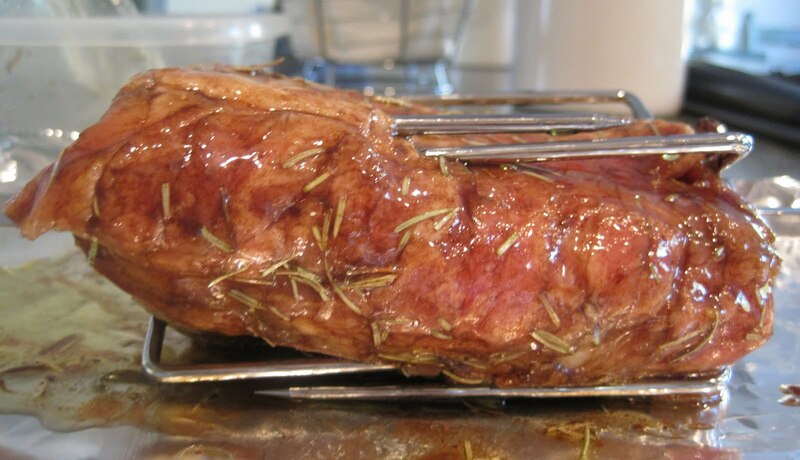 We don't use the meat thermometer on the rotisserie because the wire will wrap around as it rotates. We don't have an instant read thermometer. So we guessed. And guessed wrong. 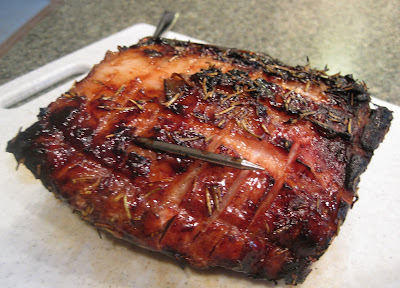 It had a great flavor from the rosemary & balsamic but it was a bit too well done. 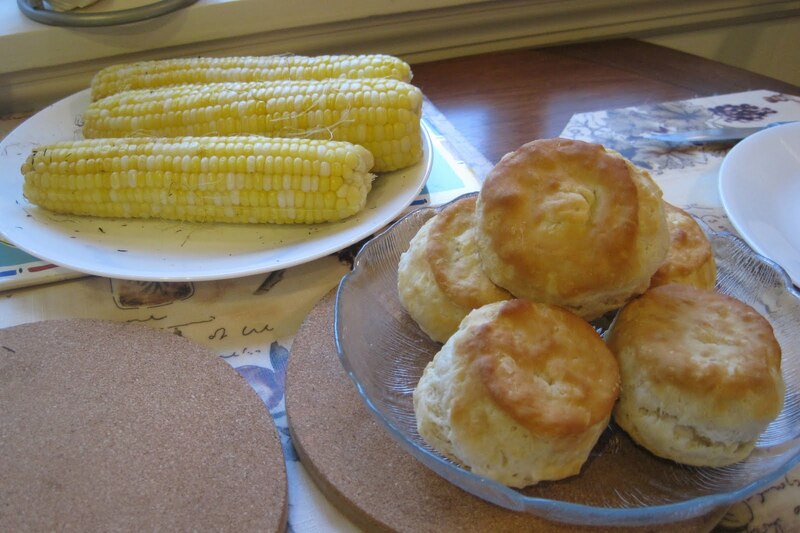 We also grilled some CSA corn and cooked some Pillsbury buttermilk biscuits - the kind from the freezer section, not the kind from a can. And steamed some CSA green beans: A yummy dinner: A very simple dinner, since we just steamed or sauteed veggies, the biscuits were a cheat, and the pork marinade was just 3 ingredients and then required no attention while it rotisseried. But simple can be quite tasty.